When my mother was pregnant with her first child she developed toxemia. She had an emergency cesarean section and learned that my brother’s umbelical cord was wrapped around his neck. He might not have survived if she’d had a vaginal delivery. Her subsequent five deliveries were unremarkable except for the fact the next four came in rapid succession and she wasn’t planning on any of us. I remember my parents often saying how lucky they were that all of us were healthy considering the odds of something going wrong in a family as large as ours. Apart from my sister Caron’s hernia, my brother Scott’s impacted wisdom teeth, Alan and Matt’s hernias, Matt’s broken foot due to a pole-vaulting accident and my broken arm, we all grew up enjoying stellar health. Must have been all of the oatmeal mush and Hamburger Helper my mom made for us. In stark contrast, Calvin has had significant neurological health issues since before he was born which have manifested in cerebral palsy, hypothyroidism, serious ocular and cerebral visual impairments, global hypotonia and—worst of all—intractable epilepsy. In the space of this past month Calvin has had to endure two x-rays of his abdomen, three enemas and a colonoscopy prep to evacuate what the x-rays revealed was his severely impacted bowels. He’s had a kidney sonogram to follow up on some hypercalcified sludge that has formed in them that could lead to kidney stones. 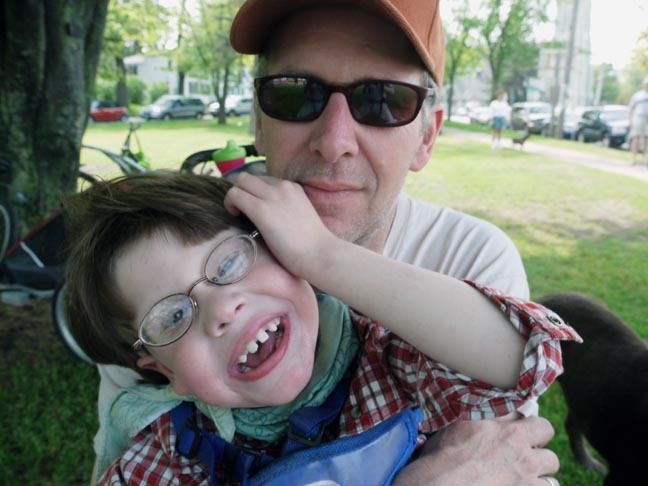 In the same time span he’s had multiple visits with his pediatrican plus appointments with the endocrinologist, the nephrologist, the optician and, in Boston, the neuro-ophthalmologist and the neurologist. His impacted bowels are apparently causing him pain, discomfort and serious agitation in addition to acid reflux so bad it's likely to have caused painful esophageal ulcerations. And, to add insult to injury he has suffered two three-minute tonic-clonic (grand mal) seizures, not to mention the constant stream of antiepileptic drugs we stuff into him every morning and every night which exacerbate all of the above. With Calvin, if it’s not one thing it’s another. And what makes it so difficult—so miserable—to witness is that he can’t tell us what is wrong. I often wonder how he manages, how he copes with almost certain distress from any variety of his ailments; maybe because Calvin doesn’t know what feeling really good really feels like. But I guess what it comes down to is that Calvin is a fighter to the core. He never gives up, doesn’t know how. And, as one of our dearest friends fondly nicknamed him once, he’s a mother-effing-badass. I couldn’t agree more. lots of ways. first, we suspected his manic behavior might be because of discomfort, plus he has had a poor appetite. he had loose stool which sometimes can mean there is a blockage that loose stool moves around. years ago calvin was diagnosed with slow gastric emptying confirmed with a nuclear medicine test. so, recently we performed an x-ray of his abdomen that showed the blockage throughout his entire colon. also, he coughed and screamed after meals and while having his diaper changed (lying down) which made me think he was having reflux. he stopped wanting acidic fruits, too. so i think he is having pain in his esophagus. he has had this same trouble and symptoms in the past and when we treated it with erythromycin (to aid stomach digestion) the symptoms improved dramatically. does this make sense? Sometimes Leland cries when we change him. We think he's trying to tell us that it hurts there - trying to convey to us in the only way he can to try and get us to do something about it.. Don't know for sure, but we don't want to discount the effort at communication. Maybe Calvin is too?